Last weekend we were non stop running. I am still trying to recover! Saturday I woke up, worked out, hit golf balls with my friend Brian, cleaned out the entire garage, had dinner and saw a show in the city with our friends Lauren and John. Woke up Sunday – drove 2 1/2 hours to Ava’s camp for a Father’s Day / new campers barbecue, drove home 2 1/2 hours, met Victor’s baseball coach on the road to pick Victor up (he was in a baseball tournament in Harrisburg) and spent Father’s Day with the family at the Friedman’s house. TAKE THAT CANCER! But here’s the weird part. After the 2 1/2 hour drive back from camp Helene and Ava left to go to Father’s Day dinner and I stayed back to pick up Victor and meet them later. 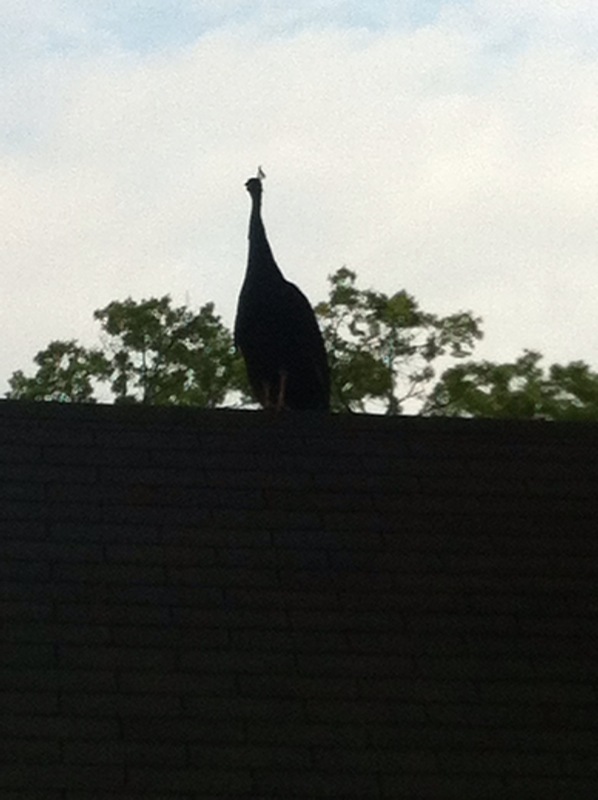 I went out for a minute to pick up fruit for the dinner, pulled back into my driveway and there was a peacock on my roof. The peacock is a symbol of immortality because the ancients believed that the peacock had flesh that did not decay after death. As such, early Christian paintings and mosaics use peacock imagery, and peacock feathers can be used during the Easter season as church decorations. This symbol of immortality is also directly linked to Christ. The peacock naturally replaces his feathers annually; as such, the peacock is also a symbol of renewal. The peacock has the ability to eat poisonous snakes without harm. Pythagoras wrote that the soul of Homer moved into a peacock—a hyperbole to establish the respect and longevity of the Greek poet’s words. A necklace of Amethyst, peacock feathers, and swallow feathers were a talisman to protect its wearer from witches and sorcerers. Christians thought, in early times, that the peacock’s blood could dispel evil spirits. The peacock often appears among the animals in the stable in Christ’s nativity. In Egyptian, Greek, and Roman mythology, the peacock feathers were considered much like the evil eye. They were all seeing. In the western world, the peacock was referred to as a slayer of serpents. The shimmering colors of his tail feathers were explained by his supposed ability to transform snake venom into solar iridescence. Alchemist thought the fan of the peacock (cauda pavonis) is associated with certain texts and images that are useful in turning base metals into gold. A symbol of immortality? A symbol of renewal? Can eat poisonous snakes without harm? Longevity? Can dispel evil spirits? All seeing? A slayer of serpents? Can turn base metal into gold? EVEN MORE STRANGE … I was the only one in the family who saw the peacock AND I was only home for about 30 minutes all day long! SO … in the 1/2 hour of the day that I was home I saw a symbol of immortality, the slayer of serpents that can dispel evil spirits? AND … I was the only one! Strange day indeed. Some might say an omen toward winning this battle. ← 6/14 – I’m a ONE! I love this. Thanks for expounding on the symbolism, so cool. Dear Brad, you know Uncle Herb and I love to shop…. so, we will be off looking for amethyst, peacock feathers and swallow feathers – probably start at Lincoln Park Zoo. Keep watching the mail!. I, like my grandmother before me, believe in symbols – and she was generally right. I almost never stop a chain letter!!! About 12 years ago my daughter Amy was on her way to the hospital for a Mastectomy. 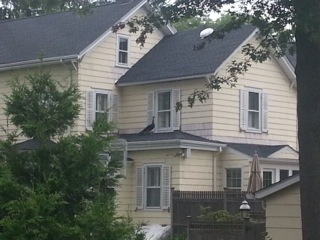 Suddenly two large black crows appeared in her back yard. She was really “freaked out” since this never happened before. Quickly thinking, I told her it was Nana and Poppa (my deceased parents) coming to wish her good luck. Am I believer? From that point on I say YES. Wow…Incredible!!! Total believer in signs!!! Looking forward to the hang the next couple weekends!!! I believe there are two peacocks nesting and basically living on my roof. They have shown themselves to me once and this was very recent. Also have a few pictures. I can hear them every night. After reading your blog, which was the first thing I read after googling “there are peacocks on my roof,” I feel completely in awe. thanks for that! enjoy! I too, am a cancer survivor and I have a female Peacock that is living in my court and yard. A dear friend of mine, who is of the Sikh faith, told me the Peacocks are spiritual protectors. That made me feel so at ease and her information has brought me to your blog.